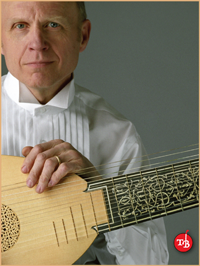 Timothy Burris has performed widely in Europe and the US, including many appearances with world-renowned early music specialists and conductors. A Fulbright alumnus, Mr. Burris holds a soloist’s diploma from The Hague’s Royal Conservatory and a Ph.D. from Duke University. He was lute instructor at the Royal Flemish Conservatory of Music in Antwerp from 1990-96, and is currently on the faculty of Colby College. In addition to his work with St Mary Schola, Mr. Burris is a founding member of three ensembles: Music’s Quill, with tenor Timothy Neill Johnson; Ensalada, with Lydia Forbes, violin and Myles Jordan, violoncello piccolo; ScheckMate, with Raffael Scheck, ‘cello.